Description Stumbled while walking in crampons and fell into a crevasse, depth about 10 m.
Note male, 22. participating in glacier course. Description Jøkulhlaup from Demmevann. The flood started before the drainagetunnel was finished. The waterlevel was observed and compared to the height of the tunnel from 1899. XXxx - 0 m (1286) 0630 - 5 m (1281) 0930 - 25m (1261) 1320 - empty (1207) The drainage took place through a tunnel at the bottom of Demmevatn. The channel was closed by icepreassure and was totally closed october 28. Description River Sima at Simadalen, HO. Jøkull-hlaup. Basin of 11,5 mill m3 drained in 3,5 hrs, -> mean waterdischarge of 900m3/s (Liestøl 1956). The drainagetunnel in the bottom of Demmevatnet had a diameter of 5 m.
Description Jøkulhlaup from Demmevatn. 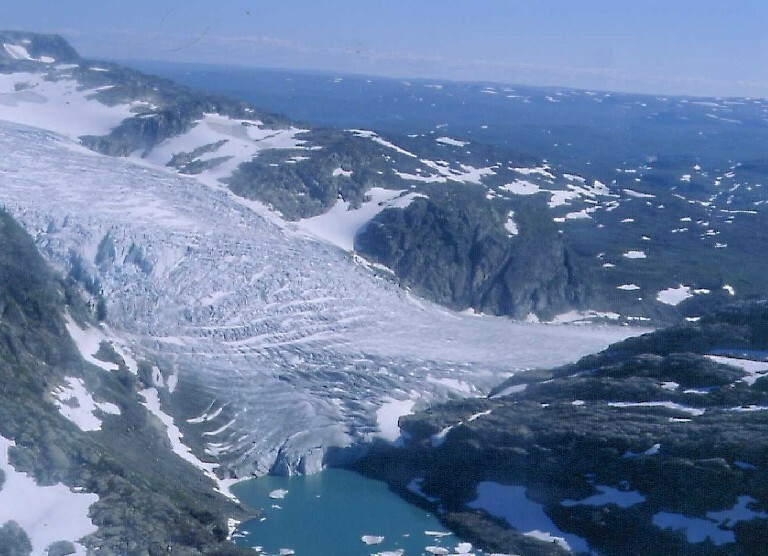 Waterlevel in Demmevann rised to above the height of glacier surface. Water drained over the glaciersurface and melted down into the ice and made a crevasse to the bottom of the glacier. 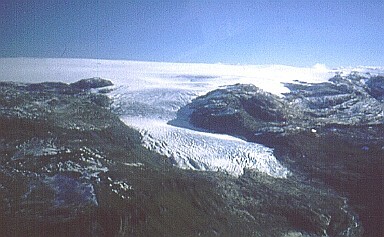 The crevasse reached the bottom of the glacier september 12. after 26 days, and Demmevann was empty. This was probably the normal way of emptying before 1893 (Liestøl, 1956). Effects: Simadalen flooded. Mean discharge: 15 mill m3/s plus normal drainage to Demmevann (4 m3/s). Note basin: 35 mill. m3, drained in 24 hours. mean discharge 400 m3/s (Liestøl, 1956). Waterlevel ca 1310 moh (Rosendahl, 1938), ~ the same altitude as Demmevasshytta.